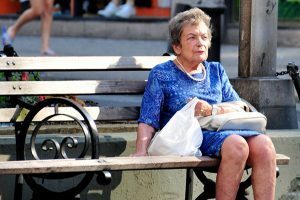 Older women in New York City: Is a crisis coming? About Liz Seegert Liz Seegert (@lseegert), is AHCJ’s topic editor on aging. Her work has appeared in NextAvenue.com, Journal of Active Aging, Cancer Today, Kaiser Health News, the Connecticut Health I-Team and other outlets. She is a senior fellow at the Center for Health Policy and Media Engagement at George Washington University and co-produces the HealthCetera podcast. View all posts by Liz Seegert → Photo: Ed Yourdon via Flickr Older adults are New York City’s fastest growing population. There has been a 20 percent jump in the 65-and-over population since 2005 and the majority (60 percent) of New York’s 1.3 million older adults are women. And many of those women are struggling. The New York City Council addressed this ongoing but, often unseen, crisis facing women as they age in a Jan. 23 hearing. Testimony by activists, experts and representatives from the NYC Department for the Aging and the Commission on Gender Equity, painted a vivid and … [Read more...] about Older women in New York City: Is a crisis coming?